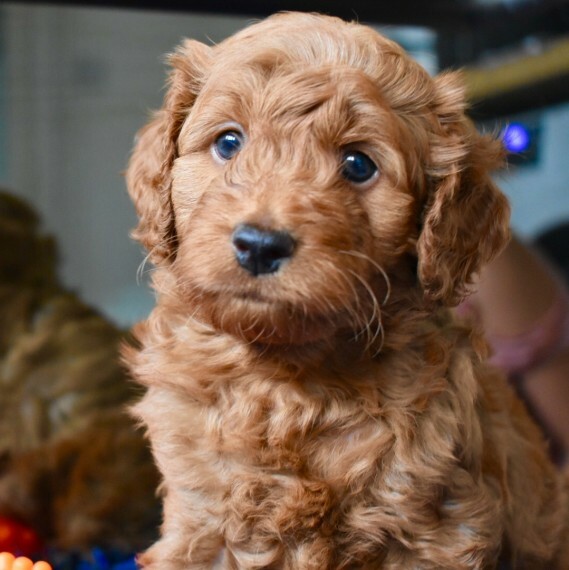 Our family has the pleasure of introducing our fabulous f1b Cockapoo puppies from our girl Poppy. This is Poppy..s second and final litter and she has produced once again a stunning litter. They are being raised indoors within a loving family environment and is used to the hustle and bustle of family life. They love playing with our two children .11 . 7.. You will not find better socialised pups. They will be ready to leave with their new families on June 18th onwards. They have been weaned on Royal Canin puppy food. wormed regularly and flea treated. They have been vet checked. microchipped and has received their first vaccination. They have wonderful parents. Mum is our loving girl . Poppy .Cockapoo. who has an absolutely amazing temperament and is fantastic with our two children and dad is a pedigree toy poodle called Jack. Poppy..s dad is clear PRA and Poppy..s mum is clear FN. Jack. the puppies dad is also clear of PRA. We have used the same stud as her previous litter. of which we have had amazing feedback on these puppies. We have available. One Black Girl . 1195 . Reserved One Red Boy . He is a beautiful colour and is so playful. He is a great character and loves to be centre of attention . 1250 One Apricot Boy . 1200 . Reserved One Apricot Boy with white markings . 1250 . Reserved One Champagne.Apricot Girl with white markings. . 1400 . Reserved One Chocolate Sable Girl . 1295 . Reserved .Owner from poppy..s previous litter. They will leave will puppy pack and 4 weeks free insurance. If you would like to visit these fabulous Cockapoos or for more photos or videos of the puppies then please get in touch. A non refundable 250 deposit will be required to secure your puppy and plenty of visits are welcome.